at the range submergence admitted. There were many seamen, of course. like swung clubs of the falling night. This entry was posted on April 7, 2015 at 5:04 am and is filed under poetry, Uncategorized. You can subscribe via RSS 2.0 feed to this post's comments. Alot of depth & intensity here… beautifully executed! When watching old movies set in submarines, I was always struck by how the sailors manage to overcome the twin fears of drowning and claustrophobia. Those scenes made me anxious – and the U-boat in your picture looks so flimsy. It must have been horrible, yes. K.
“Canister!” “human ballast!” But most, I like the captain, recall the horse that is the sea, bucking and foaming and remaining untamed in all wars everywhere. Wow. 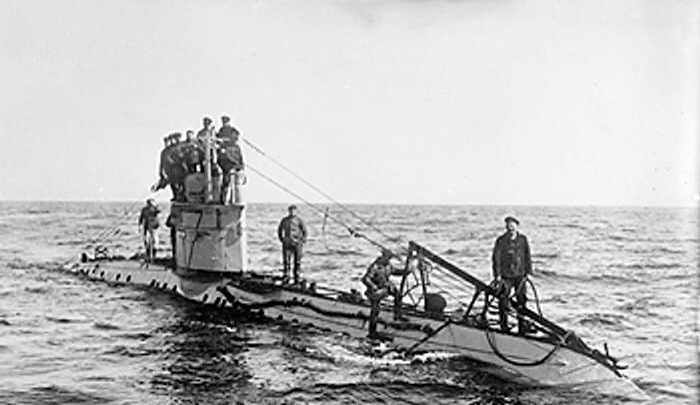 One can somewhat visualize the action of the men and get the feel of the excitement/anxiousness, imagine the sounds as they scramble in the cramp of that U-boat. Cool to read. You paint the scene so clearly and I most love the closing lines, with the tramp of their bare feet less like hooves. Very cool! The description of the horse is so vivid! Fantastic writing. You have really drawn a viciously accurate snapshot of war here, softened with your usual compassionate care for the battering of all human hearts, which here seem caught in a ‘canister’ horribly compressing, dangerous in all ways, and narrow. The middle stanza is possible one of the best descriptive passages I have read–every note is pitch-perfect, every word pulls double-weight, and the sadness and horror are almost lost in the smoke of confused desperation; the ‘need to not-miss’ that means survival, at the expense of…everything else? Anyway, a fine poem, Karin, strong and true. Thanks. I spent all day regretting the last stanza that I took out but will maybe re-do some time; and it may not have been right. I have been very struck reading about the U-boat guys – and soldiers in general–this willingness to accept the human carnage, but the revulsion at the death of animals–of course, it makes sense–the animals having nothing to do with all of this– anyway–not happy with this but must just keep going right now. k.
This is intense and well done, K! this is an amazing write. i feel as if you gave me a glimpse into a part of the world, an experience of the sea, that i would not have enjoyed otherwise. you made this so vivid and realistic. thanks for sharing. It is indeed a great photograph. And your poem is rich with movement, images, story. Brilliant! I love those old photos-you did a great job with this one! You do imagine it … and from such a sharp angle. There’s a new book out about the sinking of the Lusitania, “Dead Wake” by Eric Larsen. Read the review and was fascinated with how Larsen tried to see it some through the periscope of the German U-boat that sunk it. The pathos of that here, most so for the victim you have chosen to see here, the terrified horse someone is trying to get into a lifeboat. At least, that’s how I read this. Somehow all of it makes me feel how frail and foolish we are trying to master water. Thanks, Brendan. I had another verse that made the poem clearer and probably should include. I have the Larsen book, which is interesting, but not really that well put-together somehow–at least not to my mind–but the details about the U-boat are of course pretty fascinating. k.
Perhaps balance is an issue for everyone, everything, in every situation. A thought!